This is our first ever Christian-Buddhist weekend retreat! Registration Closed for this weekend. Please look for more Christian Buddhist Retreats in the New Year! Christians and Buddhists can use very similar techniques of contemplative prayer and meditation to help make their spiritual teachings a living part of their daily existence. This retreat emphasizes sitting and walking meditation, and include talks and discussion. There will be five Teachers in total, Father Kevin Hunt OCSO Roshi, José Ramírez JDPSN from our school, and three Special Guest Teachers. Beginners are welcome. No prior experience necessary. Retreat includes a vegetarian breakfast, lunch and dinner. Registration is Friday night at 7:00pm and Saturday at 8:30am. If you are going to stay overnight, practice will start both days at 5:30am. We are not adding an additional fee for overnight accommodations. Friday is free and you may come and stay Friday night as well if you are participating Saturday. The retreat begins Friday night with a Dharma Talk that is free and open to the public. Saturday and Sunday will be sitting and walking meditation with Interviews and Dharma Talks throughout the day. You may participate and register for either Saturday or both days! This is a very special event for us and you will have a valuable experience. Dr. Timothy Butler Sensei is Senior Fellow and Senior Faculty Advisor to Career Development Programs at the Harvard Business School. He is a clinical psychologist and has worked as a teacher, psychologist, psychotherapist, and career counselor for over thirty-five years. Dr. Butler’s research has explored the way in which individuals make meaning in their lives through choices in work roles and work environments. He is a Zen sensei in the White Plum Asanga lineage and a dharma heir of Roshi Robert Kennedy. Cynthia, Kin Ryu, Taberner Sensei received Dharma Transmission on July 15, 2017 from her teacher, Kevin Jiun Hunt, OCSO, Roshi, part of the White Plum lineage created by Hakuyu Taizan Maezumi and Tetsugen Bernard Glassman.Kin Ryu’s ceremony was witnessed by Eve Myonen Marko, Roshi, Tim Butler, Sensei, and Jose Ramirez, JDPSN.Sensei was Fr. Kevin’s first Dharma Heir. Kin Ryu received the Precepts at her Jukai ceremony in 2010. She was first introduced to meditation in the 1980s at the Center for Mindfulness in Worcester, Ma. She continued to take classes and practice vipassana for many years until she was introduced to Zen meditation. She then sat at a Zen Temple until finding her teacher. Fr. Michael Halleron Sensei was raised Roman Catholic on Long Island. He was educated by the Jesuits in high school (Regis) and college (Fordham), and was a Jesuit himself for five years. After that, he spent twenty-two years in the RC silent contemplative order of hermit monks, the Carthusians. This included twelve years in the American foundation in Vermont (where he was the first Carthusian ordained a priest in the Western hemisphere in 1979), seven years at the Mother House, the Grande Chartreuse, near the French Alps (subject of the recent documentary “Into Great Silence”, where he was also in charge of making the Order’s famous liqueur), and three years in England.In 1994, he left the monastery, and has since served successively as a diocesan priest in a number of parishes in Manhattan and the Bronx. During that time, he studied various types of yoga meditation, including kundalini, for eight years under Master Choa Kok Sui, who additionally helped introduce him to the riches of the Kabbalah. Michael also renewed contact in 1994 with his old friend and mentor, then Sensei and now Roshi Robert Kennedy, SJ, from whom he received Dharma Transmission as a Sensei in the White Plum Asanga of the Zen tradition in June, 2009. He was also formally received as a priest of the Archdiocese of New York in that same year.Fr. Michael is currently a priest of the Archdiocese of New York, serving at the Church of Notre Dame, at Columbia University. He also runs his Dragon’s Eye Zendo at the Church of St. Francis of Assisi in midtown Manhattan. Passing on the contemplative tradition in its many facets is a great passion. In addition, Fr. Michael has long been engaged in outreach to the LGBT community. He also enjoys movies and traveling, having visited more than 50 countries. Father Kevin Hunt OCSO Roshi was certified as teacher of zen in 2005 by Roshi Robert Jinsen Kennedy, student of Bernard Tetsugen Glassman and Maezumi Roshi (White Plum Sangha) Father Hunt was a Trappist Monk at Spencer Abbey for over fifty years. 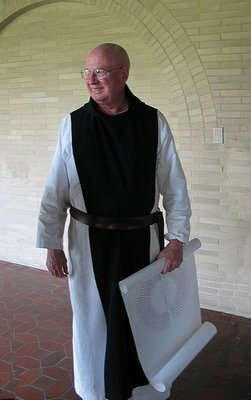 In 2004, after thirty years of Zen meditation and training, he was installed as a Zen sensei (teacher), making him the first North American Trappist to be both Catholic monk and authorized Zen instructor. 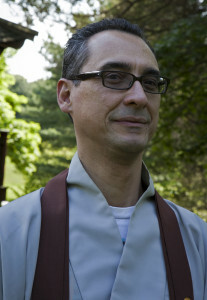 José Ramírez JDPSN is the Guiding Teacher of the Delaware Valley Zen Center, which he helped found in the Spring of 1999. He has been practicing in the Kwan Um School of Zen since 1994, and received Inka in April 2009. He has a degree in mathematics from the Universidad Simón Bolívar in Caracas, Venezuela, and a Masters and Ph.D in statistics from the University of Wisconsin-Madison. In his role as an industrial statistician he works closely with engineers and scientists to help them make sense of data. He lives in Providence, Rhode Island with his wife and daughter.